Only a person with the experience, depth, and judgment of Robert Wachter could take on the task of summarizing the impact of the digital age on the practice of medicine. But very few people who might have such experience, depth, and judgment would have pulled it off as well as he has. 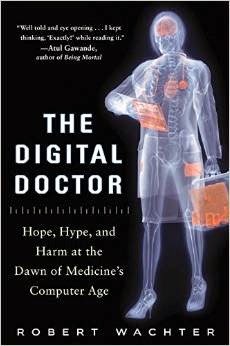 The book is called The Digital Doctor: Hope, Hype and Harm at the Dawn of Medicine's Computer Age. It will be published in April, but you can pre-order it here, and well you should. Bob is by no means a Luddite, but he is also not shy in presenting the disadvantages of the digital age. His goal, though, is to help us through this transition so medicine might actually work better in the future. Read the summary over at Amazon. Meanwhile, I'll give a few excerpts so you can get a sense of the substance and style--and the book has plenty of both. A colleague of mine, a successful physician-entrepreneur in his late sixties, recently told me about a visit to his primary care doctor after a long hiatus. "I had seen him a few years earlier, and I like him," he said. "But this visit was entirely different. This time, he asks me a question, and as soon as I begin to answer, his head is down in his laptop. Tap-tap-tap-tap-tap. He looks up at me to ask another question. As soon as I speak, again it's tap-tap-tap-tap." On the effect of PACS, the computerized radiology imaging system--the first widespread adoption of computers in medicine--which led to isolation of radiologists. Visits from other clinicians, once the norm, dropped to nothing. Indeed, interactions between and among radiologists themselves did likewise. The radiologists were lonely, sure, but their situation involves something far deeper. Hari Tsoukas . . . highlights the distinction between "information" and "knowledge." Information, he wrote, "consists of objectified, decontextualized, time-less, impersonal, value-free representations," whereas knowledge is "context-dependent, personalized, time-bound, and infused with values." . . . The emergence of PACS left radiologists information-rich but knowledge-poor. The vendors' case seems like a version of the "guns don't kill people, people kill people" argument: errors reflect poor implementation practices or screw-ups by users. This is certainly true at times, but . . . there are scores of errors that are all but inevitable given clunky software, including poor user interfaces. It seems right that the vendors would at least share responsibility if patients were harmed in such circumstances. EHRs are not simply business applications--they have become the tools that we use to take care of our patients. It is high time we reconciled these conflicting worldviews and threw our weight behind the transparency we need to keep patients safe. Epic and all the other vendors and providers need to be pushed toward a common standard that supports sharing, accompanied by a set of incentives and penalties to promote total connectivity. It should be easy for physicians to choose an office-based and relatively inexpensive EHR like athena and have it link up to their hospital's Epic system, or any of the equivalent inpatient products. Today it is not. The measure of a safe organization is not whether the person who makes the great catch gets a thank you note from the CEO. Rather, it's whether the person who sees something that seems to be amiss and decides to stop the line receives that note . . . when there wasn't an error. If the organization is not fully supportive of that person, it will never be completely safe, no matter how good its technology. Bravo! Pre-order order the book now here so you can be pleasantly surprised by the package's arrival in April and so you can read it before your colleagues. It will be the talk of the town everywhere in the country, and beyond. I think this is spot on. We can't be complacent with bad software in health especially when there will be consequences for patients. Equally dangerous is predictive analysis in health. There is a lot of bad investment happening into the computational analysis of health information without acknowledging the risks and ethical issues. Cybersecurity must also be a central issue here, but many in academia who have access to sensitive health information are not taking this as seriously as they should be. I've been interested in building a secure EHR system built around the needs of patients and healthcare professionals, but I haven't found the right people to work with yet. @Bob_Wachter looking forward to the new book. Love the last quote on Paul's blog. Exactly so. There's a perhaps apocryphal story of a junior seaman on a U.S. aircraft carrier stopping the line, i.e. no planes to land or take off, because he thought a spanner was missing from the toolbox and lying somewhere on the flight deck. It was not but the commander held a ceremony to commend his action.